How low the refinance interest rate has to be in order to recoup the refinance cost in certain number of months? How long (how many months) does it take to recoup the refinance cost? This free calculator is built to help you on the above questions. Remember that when you refinance a mortgage, you have to spend money and time to save money. So you have to crunch a few numbers to determine whether refinancing makes sense for you. Most people think the goal of mortgage refinance is to lower the regular mortgage payment so that you can save money over the term of your mortgage. When you are considering refinancing your mortgage it is important to calculate how long it is going to take you to break-even or to recoup the refinance costs. This is especially important if you plan to sell the property in a few years. If you cannot recoup the refinance costs before you sell the property, it is no point to refinance. This calculator will calculate how many months it will take you to recoup the costs of refinancing. According to the "Investing For Dummies" book, if it will take you more than five to seven years to recoup the refinance cost refinancing is probably too risky to justify the costs and hassles. Often you want to talk to several banks, but do you know what the refinance interest rate has to be in order to recoup the refinancing cost in a certain time period (for example, 5 years)? 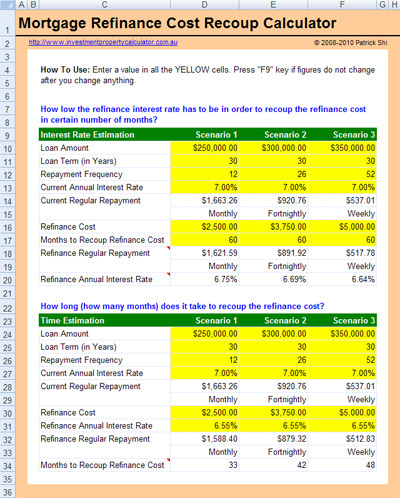 This calculator can easily help you to find out the ideal refinance interest rate. If any bank's interest rate is higher than that, you can simply walk away. 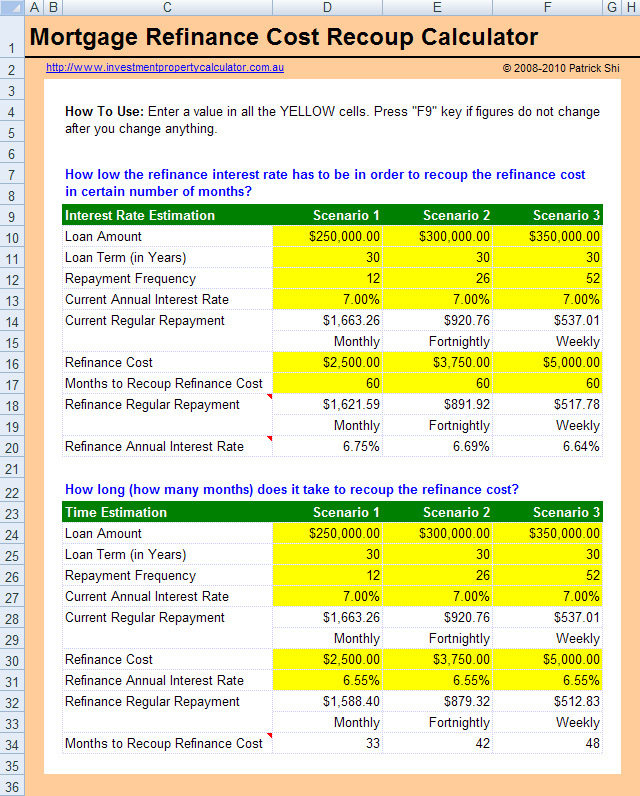 Here is a screen shot that will give you a better idea that what you need to do and how this FREE Mortgage Refinance Cost Recoup Calculator can help you. Download FREE Mortgage Home Loan Refinance Calculator Now! You may find the Free Home Loan Refinance Calculator useful as well.